Tools for digital publishing are becoming much more sophisticated. 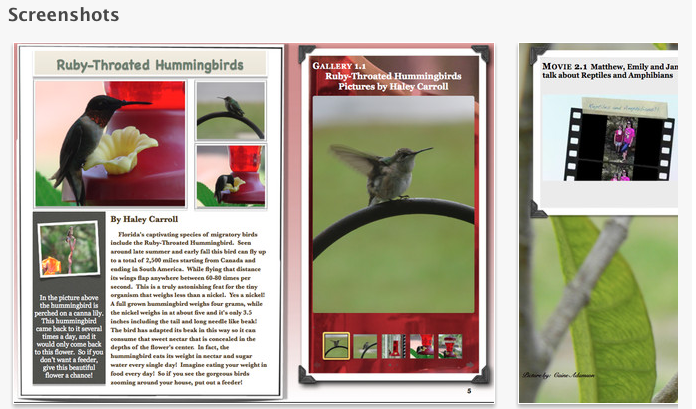 With iBooks Author, it’s now easier than ever to create interactive and visually appealing iBooks for iPad. The Apple-provided templates feature a variety of page layouts. You can add your own text and images using drag-and-drop. Interactive photo galleries, movies, Keynote presentations, 3D objects, and more can also be embedded. Completed books can be submitted iBookstore in a few simple steps. And before you know it, your students can be published authors. Many teachers are now using the iBooks Author app to create iBooks. Some have used the ePub export option using Apple’s word processing program Pages to create PDFs that can be stored and accessed on iPads (using Kindle Reader for iPad). Andrea Santilli and her seventh graders at Woodlawn Beach Middle School created a 133 page iBook entitled Creatures, Plants and More: A Kids Guide to Northwest Florida, that includes numerous images of creatures and plants. This book is an interactive field guide of Northwest Florida. The stories and photos are now a published collection that has become top seller in Apple’s iBookstore. For those interested in visiting Florida, or just reading about it, this book will bring you in contact with fascinating interactive photo galleries and videos along with detailed narrative descriptions. Mr. Smith’s 5th graders created Two Kids and a Desert Town. These special education students were greatly motivated to write for an authentic audience. The project integrated technology, provided opportunities for collaboration, and gave students the chance to reflect on their learning process. Having published this book, and knowing that individuals all over the world have downloaded it and read it, these students will forever see themselves as writers! 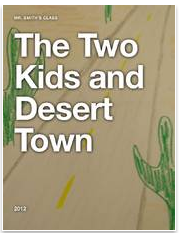 After the success of Desert Town, Mr. Smith’s students created a second iBook entitled 5th Grade: Reflections on our Year. 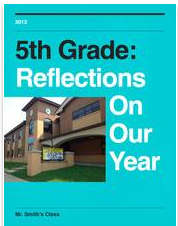 This book showcases the growth made by each student across the year. Reflecting on their progress has encouraged them to see themselves as readers and writers. 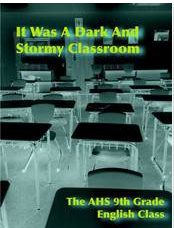 Other creative teachers, such as Chris Schillig, and his students created spin-offs works including It Was A Dark and Stormy Classroom. This book is made up of more than 40 of their collaborations and solo stories — an anthology of crime, murder and clues that proves detective fiction is alive and well in the 21st century. 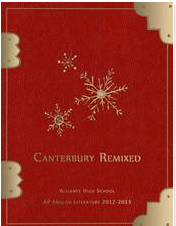 Mr. Schillig’s AP English class tried their hands at modernizing The Canterbury Tales and created Canterbury Remixed. As you peruse this book, you can see how engaging this tools in iBooks can really be! If you’re interested in learning the specifics of iBooks Author and are attending the International Reading Association conference in San Antonio (April 19 – April 22), check out Genya Devoe’s session entitled Using iBooks Author to Bring Content To Life with Your Students. The session will include an introduction to iBooks Author and an extensive step-by-step presentation in how participants can use iBooks Author to meet the differentiate needs of students and engage students in literacy in a new, exciting way. This session will take place Sunday April 21st from 9am – 10am in the Grand Hyatt Lone Star Ballroom E.
If you’ve used iBook author and have a book or experiences to share, please leave a comment. It would be great to hear from you!